Utah Arts & Museums opened the exhibit Redux: Five Fellowship Artists Revisited on Friday, February 17 at the Rio Gallery in Salt Lake City. The exhibit will continue until March 30, 2012. Rio Gallery is located at 300 S. Rio Grande Street in Salt Lake City. Hours are 8:00 am to 5:00 pm M-F. Admission is free. For more than 25 years, Utah Arts & Museums has awarded two fellowships annually to outstanding professional artists to acknowledge their artistic excellence and encourage their careers. This exhibit takes a look back at some of those fellowship winners to showcase how this prestigious award has advanced their careers. 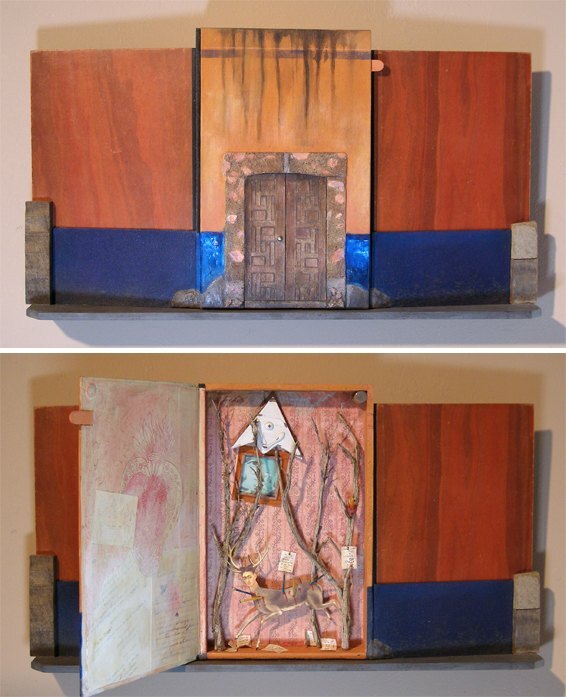 The exhibit features five fellowship recipients: Sue Cotter (1992), James Charles (1995 and 2012), Jane Catlin (2000), Gary Barton (2001), and Madison Smith (2005). 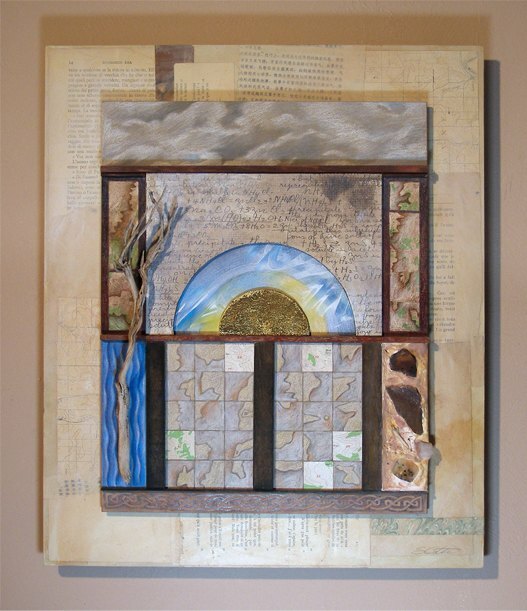 I received a $5,000 Utah Arts Council Fellowship way back in 1992, two years after my move to Utah from Reno, Nevada. I had learned letterpress printing and bookmaking at the University of Nevada, Reno's Black Rock Press where I studied and worked as an assistant for two years. Leaving Reno and moving to Utah left me without access to all the printing equipment needed for my work. 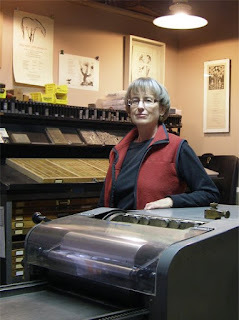 Bit by bit I found and purchased equipment as I could afford to, a printing press, paper cutter, small tools, but the Fellowship windfall allowed me to quickly complete my letterpress studio set-up. Suddenly I could buy much needed flat files and type cabinets, but most important, and most expensive of all, many fonts of new lead type in a range of faces and sizes. No more worn, nicked old used type with only two typeface options and never enough “h”s. It was a dream come true! Today my studio occupies 1/3 of a home with two studios my partner, Spike Ress and I built ourselves in Parowan. It is the first home I have ever owned and represents a commitment to living in Utah that is now going on 22 years. Our location offers Spike access to the dramatic red-rock and canyon landscape he loves to paint and puts me close to the more subtle, vast Great Basin region that inspires my work. I love setting type, putting ink on the press and seeing the magic of printing but in recent years we have been traveling extensively, sometimes away from home for months at a time. 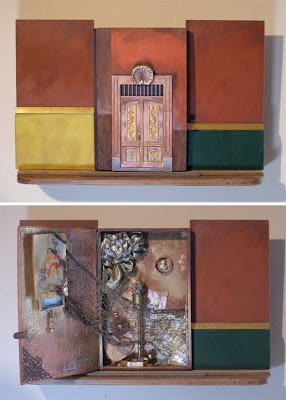 I have adapted to this vagabond life by doing more collage and assemblage work using the bits and pieces I collect wherever we go. I am still devoted to the book theme and storytelling but in less obvious forms. I will never give up my letterpress. New book ideas are forming in my head and in my sketchbooks all the time. Making art, in whatever form, is an essential part of my life. Mexican Door Story-box series: While in San Miguel de Allende I discovered weekly book sales at San Miguel's biblioteca where an assortment of discards sold for 25¢ to $1. I purchased books with bright colored covers like the houses of the city. 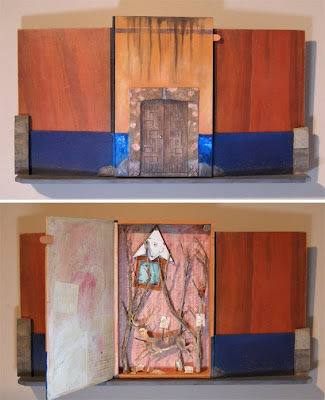 I was in love with the beautiful artistry and creativity of doors in Mexico. Using book covers as a base I recreated doors in miniature using Mexican bark paper, polymer clay, spackle, paint and beads. Each exterior façade hides an inner story. Open the box to see the tableau. In the state of Oaxaca we saw many churches built on top of ancient sites of Zapoteca pyramid temples. The symbol of the bleeding or flaming heart has a prominent place in both religious cultures. I love the overlap of old and new so visible in Mexico. This door was on the street where we rented a casita for a month. We'd walk past it every day. It was one of my favorites for its color and primitive charm. We'd see people coming and going at all hours and could only guess it was headquarters for some sort of union of artisans. In this story-box I imagine what might have been behind that door. This door speaks of much wealth and good fortune to the inhabitants of this home. The word Fortuna can mean luck, fate or fortune, all powerful concepts in Mexican culture. One year in San Miguel we saw an exhibit of some of Frida Kahlo's letters to Diego Rivera. These few letters had recently been found in a small, hand painted box hidden away in Frida's house. Frida's relationship with Diego was clearly tortured and conflicted. Seeing the actual letters and reading the translations was intriguing. That same year a friend who was looking at real estate in San Miguel was shown a rundown place near El Centro. When the agent opened the door she saw a small deer run across the courtyard into one of the rooms. She said it looked like the kind of deer Frida once kept as pets. The agent said it was a family pet though no one now lived in the house. 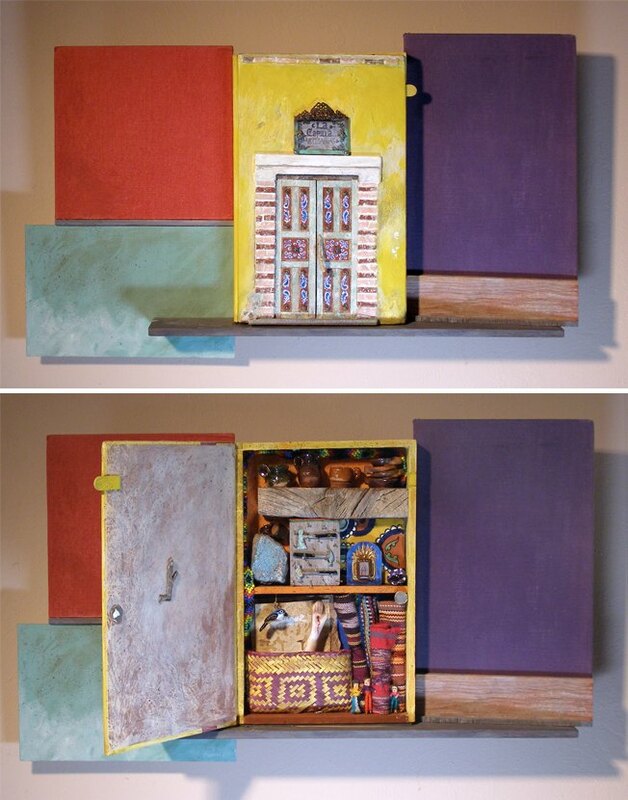 This mystery, combined with seeing Frida's letters led to this piece. Again, the book sales at the library in San Miguel supplied old books to alter into artworks. 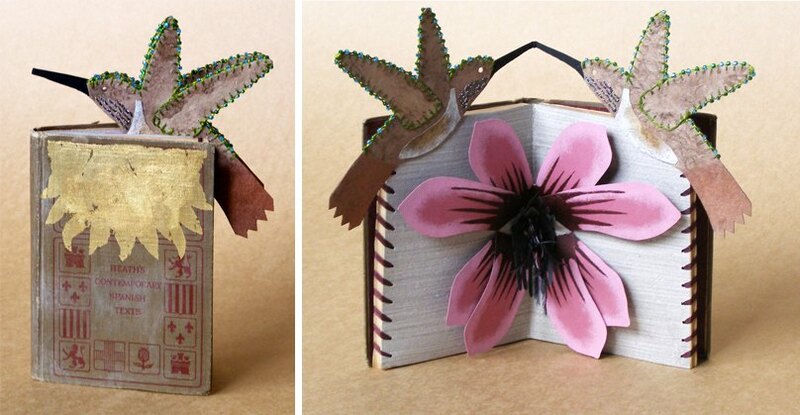 I did a series of altered books themed on birds of Mexico. A pair of hummingbirds kiss above a nectar filled blossom. The birds are made of bark paper embellished with glass beads and metallic thread. 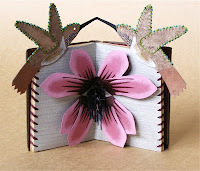 The pop-up paper flower has filaments made of black feathers. This piece is my ode to Mexico. The bird-headed woman is often seen in my work. In this representation she is an Inca dove made of bark paper, beads, and synthetic sinew. 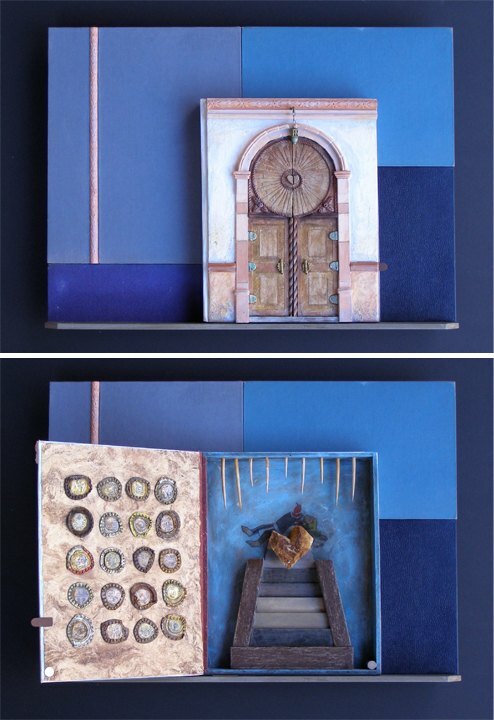 Inside is a handwritten excerpt from one of my Mexico travel journals and a niche filled with a jumble of small treasures. I have been making rock-books for many years. I find rocks that are already cracked and splitting open into book covers. Often the shape of the rock suggests the theme for the book. The shape of this rock said “skull” so this book just had to be about Day of the Dead, a Mexican tradition we experienced firsthand one year while in San Miguel the first week of November. 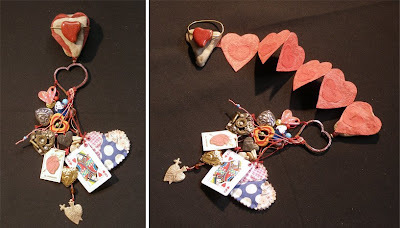 A heart shaped rock-book with a humorous twist. It speaks for itself. This little egg-shaped rock became a “field guide” to birds' eggs. 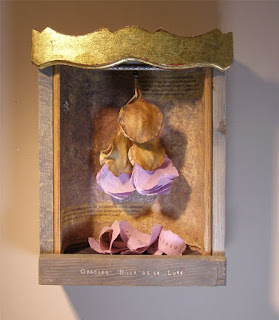 The pages are made of paper wasp paper backed with handmade abaca paper. The eggs were painted in watercolor, cut out and glued on. The glass jar with its wonderful patina and rusty lid were found in a junk pile in Taos, New Mexico. 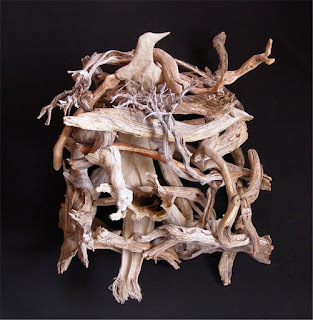 A few small natural treasures are also included in the jar like a child's precious collection. The idea for this assemblage was inspired by jacaranda pods, abundant on the ground in Mexico in the springtime. 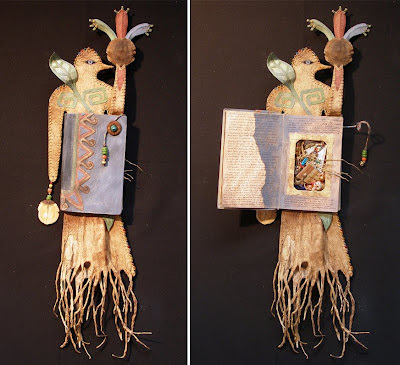 The Mayan myth of The Daughter of the Moon is represented here with handmade paper flower petals and a tiny silver bird. From the rooftops we could see much of the colorful life going on all across the city. We spent a lot of time up there sipping coffee in the mornings and margaritas in the evenings. I collect a wide range of materials wherever we travel. This assemblage and book were constructed using wonderful “debris” from the streets. 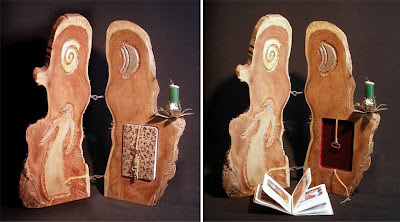 Mesquite wood diptych with book. The slab of wood was given to me by a friend Patricia Valencia who talked a Benedictine monk woodcarver out of it because she knew I'd like it. Since it came from the monastery property, I decided to make it an altar of sorts. This altar honors fond memories of Mexico Days. The idea for this work grew from travels in several countries in Europe where we tried to quickly adapt to whatever language was spoken, often getting confused – bom dia, buenos dias, or buon giorno? Oui or Si? I have studied both French and Spanish. I am not good with either and often tangle them together. Nevertheless, I hope to continue traveling and learning. I arrived early morning in rain-soaked Ireland after leaving from Las Vegas, Nevada, flying all night. In a jet-lagged brain-fog two landscapes merged into a surreal vision. 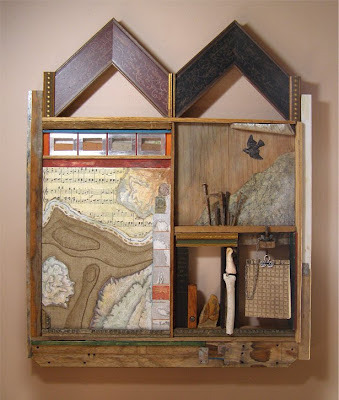 This assemblage is about the beauty, magic and mystery I find in the western desert landscapes of the U.S. In spite of my wanderlust, this is where I feel most at home.